Learn more about the Lorex 4K Ultra HD 8MP Nocturnal IP Camera. Get pricing, and answers to common questions. The Lorex 4K Ultra HD 8MP Nocturnal IP Camera features a 8MP image sensor, high-efficiency video compression, and color night vision technology. 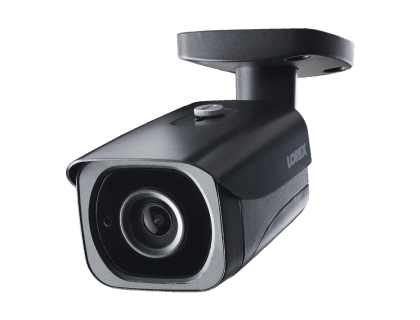 This Lorex business security camera's HD quality monitoring and 112° camera lens offer broad fields of view that will capture useful evidence in the event of an incident. 200ft maximum night vision range. 112° FOV for monitoring wide, open areas. Pros: Outstanding video quality, great wide angle lens, and amazing night vision capabilities. Cons: Technical support could improve their response times. Bottomline: Fantastic security camera that offers superb perimeter and blind spot coverage for your business. What are some alternatives to the Lorex 4K Ultra HD 8MP Nocturnal IP Camera? Where can I buy the Lorex 4K Ultra HD 8MP Nocturnal IP Camera? The Lorex 4K Ultra HD 8MP Nocturnal IP Camera is available via Amazon and the Lorex website. Does the Lorex 4K Ultra HD 8MP Nocturnal IP Camera work at night? Yes. The Lorex 4K Ultra HD 8MP Nocturnal IP Camera features color night vision (CNV) technology that can see up to 150 ft. and offers infrared night vision of 200ft. It includes digital noise reduction capabilities for low light environments. Can the Lorex 4K Ultra HD 8MP Nocturnal IP Camera be used in any weather? Yes, the Lorex 4K Ultra HD 8MP Nocturnal IP Camera has IP67 weatherproof ratings, and can be used in any weather. The combination of a high-grade aluminum casing and vandal proof designs offer greater outdoor protection and can operate in extreme temperatures, ranging from -22 °F to 140 °F.